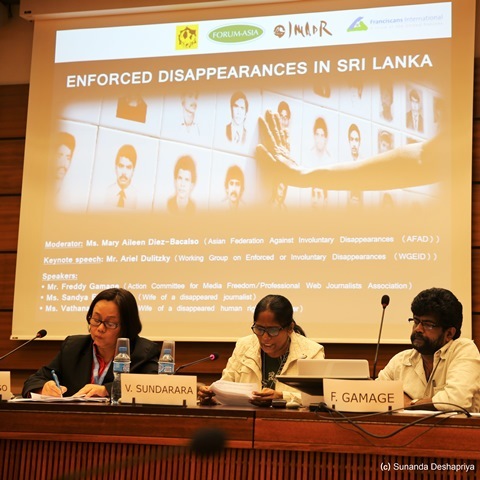 On Tuesday 20th September, during the 33rd session of the UN Human Rights Council, the International Movement Against All Forms of Discrimination and Racism (IMADR), jointly with Asian Forum for Human Rights and Development (FORUM-ASIA), Asian Federation Against Involuntary Disappearances and Franciscans International, hosted a side event titled “Enforced Disappearances in Sri Lanka”. With the moderation by Ms. Mary Aileen Diez-Bacalso from (AFAD), the event invited two wives of the disappeared, Ms. Sandya EKNELYGODA and Ms. Vathana SUNDARARAJ, to share their perspectives on challenges victims are facing. 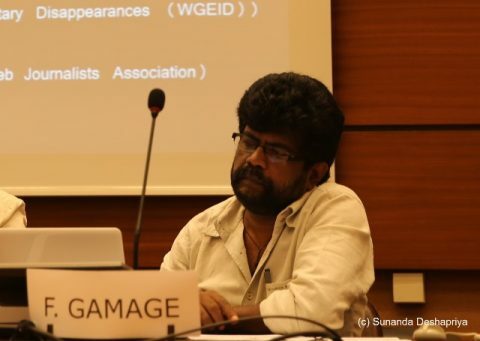 Mr. Freddy GAMAGE, a journalist and human rights defender, spoke the issue of murdered and disappeared journalists to highlight the need for institutional reforms to tackle the culture of impunity. 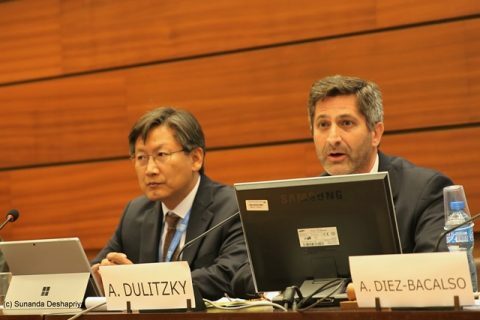 In his keynote speech, the expert member of the UN Working Group on Enforced or Involuntary Disappearances (WGEID) , Mr. Ariel Dulitzky, provided the findings from the Working Group’s country visit to Sri Lanka in November 2015. 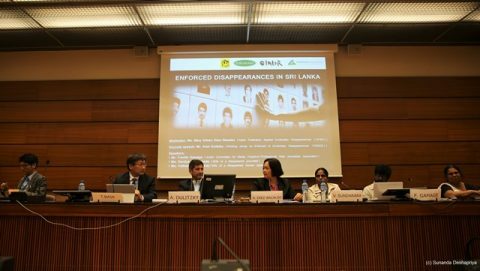 In opening of the event, Ms. Diez-Bacalso noted that over 12,000 cases were submitted to the UN Working Group and Sri Lanka is the latest the government which ratified the ratification of the International Convention for the Protection of All Persons from Enforced Disappearances. The first speaker, Ms. Sundararaj begun her appeal on behalf of thousands of family members of the disappeared and political prisoners. She recalled the hope brought by the Human Rights Council resolution 30/1 in October 2015, but she shared frustrations of victims for the slow progress made by the Government of Sri Lanka (GoSL). She expressed concern on the level of political will due to the insufficient consultations with affected communities and civil society in designing of the Office of the Missing Persons (OMP). Her experience with the previous Presidential Commission to Investigate Missing Persons in the North and East (‘Paranagama Commission’) makes it difficult for her to place confidence in the OMP. She stressed that the GoSL must not delay in disclosing what happened to the disappeared victims and their whereabouts. She reminded the participants that many female members of the disappeared are struggling to survive. She further addressed the issue of the Prevention of Terrorism Act (PTA) as a source for arbitrary arrests, detention, torture and intimidations. While calling for immediate repeal of the PTA, she emphasized the importance of independence of judiciary. In her conclusion, she appealed to the UN and international community to continue to urge the GoSL to ensure meaningful consultations with and inclusion of victims for transitional justice mechanisms. 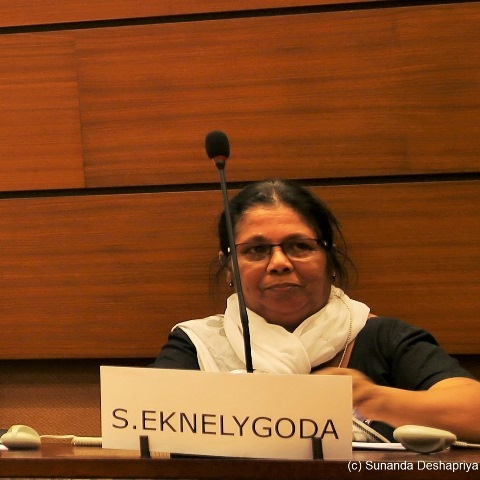 The second panelist, Ms. Eknelygoda, a wife of the disappeared journalist Prageeth Eknelygoda , described her journey as a human rights defender both at the national and UN levels. While acknowledging changes in the Government, she pointed out that socio-economic situation of families of the disappeared remains severe. She shared difficulties she has had in the process of criminal investigation into her husband’s case including threats and harassments by the former President and his allies as well as extremist Sinhala Buddhist forces. She regretted the insufficient consultations prior to the establishment of OMP as well as the lack of incorporation of proposals from victims and civil society in the OMP Act which were to include “enforced disappearances” in the name and international standards in the Office. She stressed the importance of mechanism for truth-seeking, justice, reparations and non-recurrence to alleviate the situation of victims and their families. She posed a number of questions to the GoSL such as “When the mechanism of truth-seeking will be established?”, “Who would be responsible for the mechanims?” and “Will families of the disappeared be represented in the OMP?” As a victim, she put a strong emphasis on the need for proper consultations with affected communities for a successful mechanism to deal with the issue of enforced disappearances. 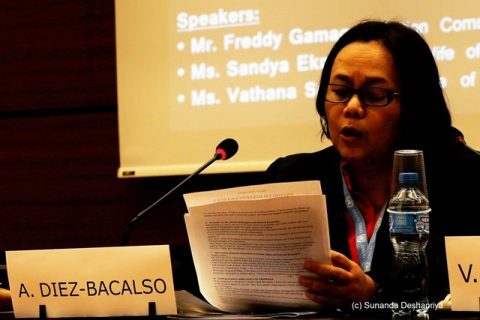 Based on her own experience with the domestic justice system, she strongly believes that international experts must be included in order to build a trust from affected communities and make the mechanism successful. In conclusion, she shared the concern of families of the disappeared whether perpetrators will be punished or not. Mr. Gamage, a journalist and human rights defender from the South, encouraged every stakeholder to constructively engage with the GoSL in order to bring more needed reforms, since most of the Government’s reform plans are just to please the international community. He then shared the story of disappeared Tamil journalist Subramaniam Ramachandran from Jaffna. He has been disappeared since 2007 allegedly due to his journalism. Despite the request by the police and military to his father to submit his personal documents in 2009 and the complaint later filed to the police by his father, there has been no progress to date. Ramachandran’s case is one of the few cases where there are compelling evidences and eyewitness. While welcoming the OMP, Mr. Gamage demanded the Government to consult with family members of the disappeared. He described the Ramachandran’s case as one out of the 44 cases of journalists and media workers who were murdered, abducted or assaulted under the hands of previous regime. He pointed out the Government’s reluctance to address those cases from a viewpoint of justice and their limited focus on compensations to the families. He urged the Government to begin investigations to the cases of Tamil journalists that are left unaddressed. A group of journalists are demanding the Government to first work on few cases of Tamil journalists which have sufficient evidences and witnesses. In his final remark, he introduced the case of a physical attack against him on 2nd June this year as a clear example of institutional challenges, since the suspected commander of the attack has not been arrested. As a keynote speech, Mr. Dulitzky from WGEID shared the Working Group’s findings from the official visit to Sri Lanka in November 2015. He described that the country visit was characterised as “mistrust” and “frustration” to describe the feelings of victims and civil society in Sri Lanka due to the history of failed domestic mechanisms and culture of impunity. He stressed that wounds of families of the disappeared are open until they find truth and justice. At the same time, the Working Group found a hope with the new Government in initiating measures including the ratification of the International Convention for the Protection of All Persons from Enforced Disappearances, the policy on the issuance of certificates of absence and the OMP. Yet, he stressed that more needs to be done. He highlighted the importance of OMP as a specific institution in searching for the disappeared which is independent from the judicial process, since searching and investigation are separate processes. He shared concerns on the OMP. The Government must conduct proper consultations with affected families and civil society. The Office’s name failed to include enforced disappearances which can send a wrong message, since it makes the crime of enforced disappearances invisible, dilutes the State’s responsibility and searching for missing persons and forcibly disappeared persons are different. The importance of appointment of professionals, allocation of resources and the OMP’s link to the accountability mechanism are important. The certificate of absence should be issued as a certificate of absence due to enforced disappearance. The Working Group strongly believes that international participation is necessary to address the issue of enforced disappearances due to the culture of impunity, the lack of will of the security forces to cooperate, the lack of independence and impartiality of the office of Attorney General and the lack of national capacity to address the crime against humanity. International involvement can also help overcoming the mistrust of families of the disappeared. More needs to be done for reparations for sufficient economic and psycho-social support. In conclusion, he emphasised the need for a State policy to memorise the victims of enforced disappearances and that fact that no justification is available for the crime of enforced disappearance. 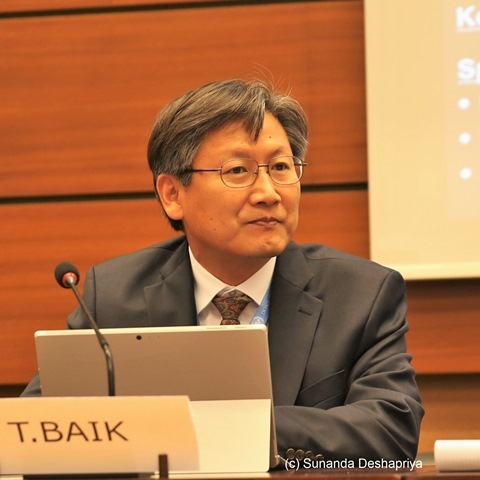 In response to the question from the floor whether the Government’s measures are genuine or not, Mr. Tae-Ung Baik from the WGEID answered that this is a good opportunity for the GoSL and international community to collaborate to make real changes. He also told the participants that international elements should be included.